A Separation is a puzzle. It is a human mystery of heartbreak, love, family, commitment, truth, lies, faith and responsibility, each overlapping on top of the other in a way that is dexterous, multifaceted and, most of all, real. The movie is an honest examination of a marriage in flux, showcasing a foreign world that ends up being as intimate and as close to home as any so many of us are currently living in each and every day. 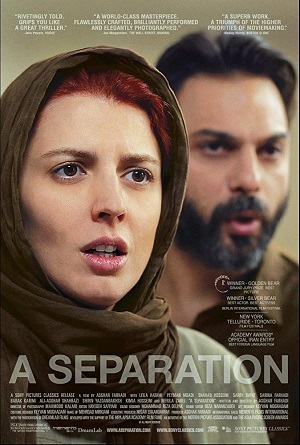 The movie begins with Simin (Leila Hatami) and her estranged husband Nader (Peyman Moadi) sitting in front of an Iranian judge discussing a potential divorce. She wants him to accompany her out of the country, and even if he refuses to go she wants to take their daughter Termeh (Sarina Farhadi) with her. But he wants to stay as he needs to take care of his Alzheimer’s afflicted father (Ali-Asghar Shahbazi). Termeh refuses to leave with Simin if Nader doesn’t decide come along, the young girl eager to do whatever she can to keep her family together. Things fracture in a multitude of ways from there. Simin cannot leave without her daughter but she cannot remain with Nader so she moves in with her parents. Nader cannot take care of his father on his own, hiring the pregnant Razieh (Sareh Bayat) to supervise him during the day while he is at work. Razieh struggles with the task, both her condition and her religious beliefs making what is required of her far too difficult for her to continue in the job. Nader agrees to hire Razieh’s husband Hodjat (Shahab Hosseini) to take her place, but when he’s put in jail for failure to pay his debts the wife must clandestinely continue her nursing duties until he is released. When everything falls apart all of the human elements at work in A Separation begin to collide in a way that’s fascinating. Mistakes are made, lies are told and truths are revealed. Reality bends and bleeds with relationships being put to the ultimate test. The mysteries at the heart of this drama are so personal, so visceral, so unshakably genuine they could almost drive a person mad mulling over all of their innate hauntingly metaphorical intricacies. What is so astonishing about writer/director Asghar Farhadi’s drama is how universal it is. Simin and Nader’s breakup could be just about anyone’s of any nationality in any corner of the planet. I’ve met these people. I’ve shaken their hands and had long conversations about the weather or the current state of the Seattle Mariners with them. I’ve babysat their kids and bought them Christmas presents. But that’s the point. While the viewer is given unseen insights into the judicial machinations of Iran, while the setting and the political dynamics might seem alien, while the cultural male-female aesthetics aren’t always easy to grasp, the central storylines are gut-wrenchingly familiar. It’s easy to imagine just about anyone in many of these same situations, to believe that any of us could feel ourselves pushed into a similar corner where we might state the same lies. These people are us and we are them, and while their stories aren’t beds of wine and roses the rocky canyons they’re traversing are hardly unfamiliar, making the eventual outcomes all the more astonishing when the central threads begin to tie themselves together as one. I’m leaving a lot unsaid, not revealing what takes place between Nader and Razieh and how their arguments end up affecting those they love. The reason for this is simple enough; I don’t want to ruin the surprises. All of these characters overlap and mingle with one another, their issues and problems cycling into the ones being dealt with by the others and vice-versa. Everyone has demons they are facing, have higher powers (whether religious or the woman they still desperately love) to deal with, and how they look them in the eye and figure out what to do next is part of the tragic joy this picture revels in. I’m not going to tell you A Separation is a happy movie, not going to try and convince anyone that Farhadi’s familial opus makes anyone walk out of the theatre with a smile on their face or a spring in their step. But it is an exercise in cathartic brilliance, and even if the enigmas facing Simin and Nader are not completely resolved the astonishment I felt witnessing their travails was something that went well beyond extraordinary. Put simply, this picture is one of the great cinematic achievements I’ve ever seen, and in my opinion is the best film I saw in 2011.